Five people have been arrested after Greenpeace protestors boarded a cargo ship in the Thames Estuary, while others stormed a port in disruption lasting 36 hours.They were demonstrating against Volkswagen and its diesel vehicles, as shipments arrived in the South East. The target, Sheerness Port, on the Isle of Sheppey. But, the German car giant told us its shipment contains vehicles that meet strict EU standards. Tom Savvides has the latest. Greenpeace have been protesting outside the Prime Minister's Oxfordshire home over fracking. Greenpeace is turning David Cameron’s constituency home into a fracking site in a demonstration against controversial legislation clearing the way for under-house drilling. The measures are expected to be announced in the Queen’s Speech later today. Greenpeace is turning David Cameron’s constituency home into a fracking site to demonstrate over controversial legislation clearing the way for under-house drilling expected to be announced in the Queen’s Speech later today. Greenpeace UK energy campaigner Simon Clydesdale said: “David Cameron wants to rob people of their right to stop fracking firms drilling under their homes – surely he won’t mind if we kick off the under-house fracking revolution below his own garden. “The Prime Minister is about to auction off over half of Britain to the frackers, including national parks and areas of outstanding natural beauty like the Cotswolds. “Fracking won’t deliver energy on a meaningful scale for years, if ever, by which time we’ll need to have moved away from dirty fossil fuels and towards high-tech clean power if we’re to head off dangerous climate change." Activists in hard hats and high-vis jackets have turned up on the doorstep of the Prime Minister’s period cottage in the Cotswold hamlet of Dean, Oxfordshire, this morning. They are now sealing off the property’s front gate with security fencing and hanging a sign reading, ‘We apologise for any inconvenience we may cause while we frack under your home’. In his first interview since being back in the UK, Phil Ball told Meridian not knowing how long he would be in prison was the worst part. 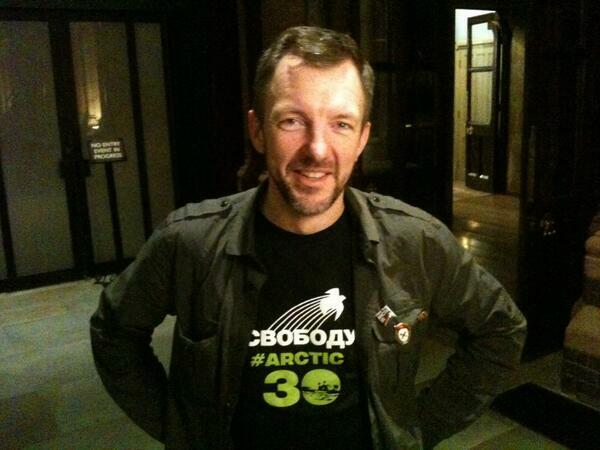 Brits including Oxford's Phil Ball have finally returned to the UK this afternoon after being detained in Russia following Greenpeace protests. Greenpeace have sent us this video of the activists returning home to the UK at St Pancras station. The Greenpeace activists involved in the Arctic protest have finally returned to the UK today, including Chipping Norton's Phil Ball.